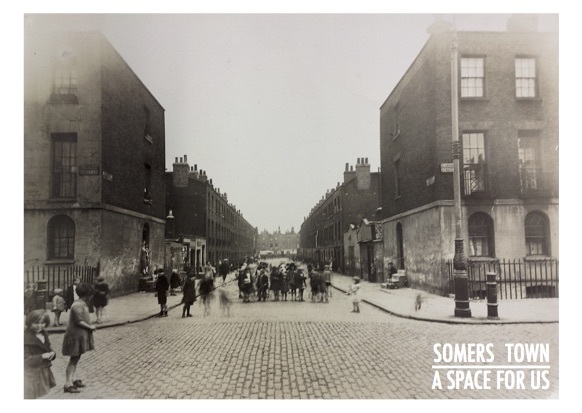 Our last history event was a walk round Somers Town with a Camden Tour guide. 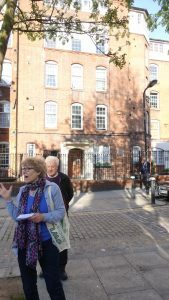 She walked us through the different ages of social housing, starting with St Pancras Housing, to LCC to the golden age of Camden Council exemplified by Oakshott Court, with a detour to the Grafton Chambers, which we learnt once housed women medics from the old Elizabeth Garrett Anderson hospital – which though listed, may well be demolished by CrossRail 2. Soon to be history! It was a lovely evening and locals Doug, George and Alan kept her on her toes by adding anecdotes of their own, from spivs to stealing wood from bomb damaged churches, and old laundries. 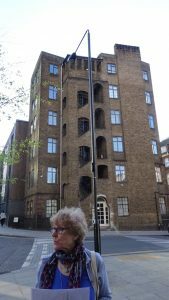 But some of us were surprised by things we learnt – I didn’t know about the memorial to Irene Barclay. Thanks to the guide and the keen participation! More next month – bring photos and memories for June 1st 6pm.